Feng Shui, the ancient Eastern practice of correct furniture placement and creating a ‘Zen’ or tranquil atmosphere, suggests that our entire being is actually influenced by the space around us. Feng, meaning ‘wind’ and Shui meaning ‘water’ combine to create color and design elements in your home that can bring both relaxation and serenity or heighten energy and productivity. Just as nature includes the components of Fire, Earth, Metal, Water and Wood – the human body contains these elements as well. 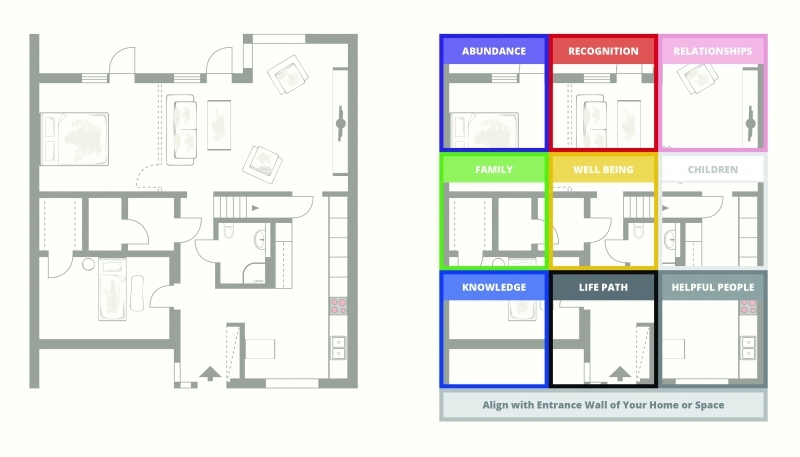 A well-balanced Feng-Shui home keeps in mind the Five Elements when designing to ensure all are represented so proper energy can flow in the space. One of the easiest ways to bring in Feng Shui is through color. Warm colors can energize, lighten and animate your state of mind. Cooler color choices can soothe, relax or rejuvenate you. According to the principles behind Feng Shui, color can even impact something as simple as your doorway. A red doorway inspires passion as you enter the home, a blue one offers a place for serenity, infuse yellow for a center of happiness and joy. Confused as to what color brings what Chi? 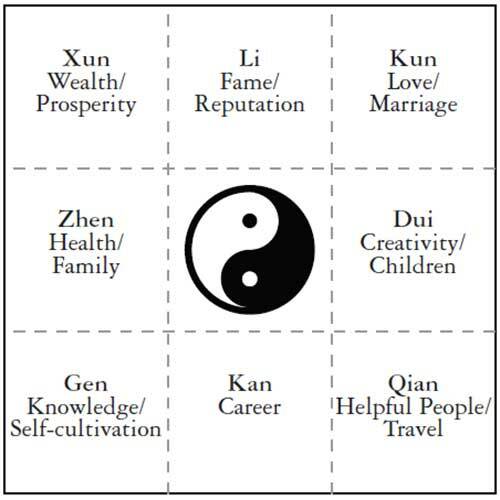 This is where a valuable Feng Shui tool comes in – The Bagua Map. This little blueprint of color holds the key to creating the correct Chi and color correlation in your space. • In Your Kitchen – Painting your kitchen white allows the colorful dishes you prepare to speak for themselves. The kitchen’s element, which is naturally Fire, (hot reds, greens and yellows) is overcome by the element Metal (represented by the stark, pure White) thus creating the best balance in this space. • In Your Bedroom – Rose, blush and subtle pinks create a perfect setting to increase love, so it is a natural bedroom color choice. Greens and blues allowing for calm and peacefulness are also great choices. • In Your Dining Space – Eating together, flowing great conversation and sharing love are all achieved when you paint a dining room pink, green or blue. These colors are all stimulating, appetite-inducing choices that are great for keeping your hungry crowd satisfied. • In the Bathroom – This high-traffic area can become an area of tremendous rush, as you get ready in the morning or at the end of a long day. Painting the bathroom in warm grays, blues, pinks or even white will create calm and serenity. These are often colors seen in a spa because they induce thoughts of the Water Element that offers purification for both mind and body. Whatever room you choose to begin your Feng Shui journey, remember that your space has the power to define your state of mind and increase the energy for your well-being. Choose color wisely and your home will pay you back with more restful nights, more energized days and more abundant relationships.